The fourth Concert Hall Research Group (CHRG) Summer Institute was held in Santa Fe, NM July 25-29, 2010. See below for a summary of the event. Over 70 people participated in the event, including 14 faculty members, a few local faculty, 3 distinguished educators, 17 professional participants and 19 students. The main topics for the institute were spaces for chamber music and opera houses. In addition to presentations about these topics, the group toured venues and went to performances from both the Santa Fe Chamber Music Festival and The Santa Fe Opera. 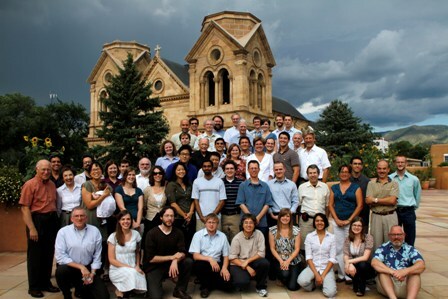 A group photo of the CHRG Summer Institute Santa Fe 2010 participants is shown below (see Photos for additional pictures), and a detailed list of attendees can be found on the Program & Faculty page. CHRG Summer Institute 2010 was the 4th Summer Institute since the initial conference in 1999, held at Tanglewood. The conference was held at the historic La Fonda Hotel, on the Plaza in downtown Santa Fe. The highlights of the week were three listening experiences – Santa Fe Opera, Santa Fe Chamber Music Festival, and a private demonstration of the reverberation enhancement system in the Lensic Theater. The Santa Fe Opera has a worldwide reputation for excellent production values, superb acoustics, and beautiful setting in the hills outside Santa Fe. The audience area has no side walls, yet the singers are loud and clear throughout the 2200-seat opera house without any sound reinforcement. The conference attendees took a private tour of Santa Fe Opera led by production director Paul Horpedahl, and attended the evening’s performance of Life is a Dream by Lewis Spratlan. In the afternoon, three members of the design team for the 1999 additions and renovations made presentations about their work on the project and the unique design features of the Santa Fe Opera. The design team representatives were Tim Hartung, the project architect from the Polshek Partnership (now ennead architects), Len Auerbach of Auerback Pollock Friedlander theater consultants; and Tom Clark of Artec, who worked as director of AV systems for Santa Fe Opera and also worked on the AV system design. The chamber music concert was in a much smaller venue, the Saint Francis Auditorium, which is the presentation space in the New Mexico Museum of Fine Arts. Saint Francis Auditorium has a seating capacity of 600 people, and the architecture is based on a mission-style church, typical of historic churches in the Southwest. The performance was Mahler’s song cycle, Das Lied von der Erde, arranged for twenty-piece chamber orchestra. The following morning a panel of six faculty members compared their listening impressions from the previous evening’s concert. There were some significant differences in the sound depending on the listener’s location within the auditorium, with listeners in the balcony reporting the best sound. The third listening experience of the summer institute was in the Lensic Theater, a former vaudeville theater and movie palace in downtown Santa Fe. The Lensic has been converted to multi-use auditorium with a full fly stage and an audience capacity of 820. The stage has a complete concert shell, used for concerts by the New Mexico Symphony Orchestra and smaller ensembles. For symphonic and chamber music performances the Lensic has a reverberation enhancement system built by Acoustic Control Systems (ACS). Arthur van Maurik of ACS arranged for a 5-piece brass ensemble to perform while CHRG participants listened to the music with and without the reverberation enhancement system. Since this was a private demonstration, participants were free to move around and listen from different parts of the audience area and stage. Most people agreed there were no cues that the sound was being enhanced by loudspeakers. Participants also had the opportunity to ask the musicians about their experience and impressions of the system. One of the players also performs in the New Mexico Symphony Orchestra, and he said it would not be possible for the orchestra to perform in the Lensic Theater without the reverberation enhancement system. The institute had participants from across the united states and also international representation with attendees from Hong Kong, Chile, Argentina, Spain, Sweden, and England. A total of 19 student participants came from eight different universities. A participant of special note was Charles Schmidt, Executive Director of the Acoustical Society of America. Faculty presenters included Neil Thompson Shade, Rick Talaske, Scott Pfieffer, Damian Doria, David Kahn, Russ Altermatt, Robert Essert, Anne Minors (Theater Consultant), Paul Scarbrough, and Steven Ovitzsky, general manager of the Santa Fe Music Festival. Carl Rosenberg presented on behalf of Chris Jaffe, who was unable to attend. A keynote lecture was given by architectural historian, Victoria Newhouse, analyzing how the success of concert halls and other arts facilities is related to the degree of involvement of the end users with the design team. The conference was organized by Michelle Vigeant, Tim Foulkes, Carl Rosenberg, and Bill Dohn.